Ruth Cook Raper, daughter of Henry Barton Cook and Sallie Gustavia Wells, married to Joseph Clayton Raper and buried in Dewey Cemetery, Lawn, Taylor County, Texas. Content School District in Runnels County, Texas Teacher (1929-1930). Lawn Independent School District Grade School Teacher (1930-1934) and (1956-1957). First Jim Ned Consolidated Independent School District Fifth Grade-B Teacher (1957-1959). LAWN--Ruth Cook Raper, 89, died Thursday in an Abilene nursing home. Mrs. Raper was born in Lawn and graduated from Abilene High School and Simmons College, now Hardin-Simmons University. 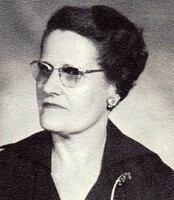 She taught elementary school in Content in Runnels County from 1929-30 and Lawn from 1930-34 and 1956-59. She was a former member of Order of the Eastern Star Chapter 30 in Abilene. She was a member of Lawn Baptist Chruch and was the widow of J.C. Raper, whom she married in 1933 in Moran. Survivors include one sister, Helene Tyree of Raleigh, N.C., and several nieces and nephews.